4 stars. While I am very content with what I read here, I will definitely be looking forward to read Tamsin's story, and Mira's story! Usually I'm kind of wary of companion sequels in YA, but I love how Mead has the series set up. Cedric and Adelaide's ending was perfect! Yay! Now, I know I'll pick this one up, Alyssa!! It sounds like she did a good job with the setting especially. And you know how excited I get when you mention a slow burn romance. YES! I meant to message you before writing my review (however, I need to hibernate until after 4 PM on Friday!). This one was better than I expected! Great review, Alyssa! I have this and Soundless on my TBR, but I have been putting off reading soundless because of the majority of the meh reviews. I am loving the new trend of using historical-ish settings in books! We need more of those! I already plan to get this book and your review assures me that it will be a really good read. Good to know that you like this. I have Soundless,and I need to read it before it expires. I hope you love it, Erin! I've had my eye on this one too! I hope it's amazing!! I hadn't read one up until a few months ago! I really liked this one. And isn't that an intriguing aspect of the series? I like it! Awesome review Alyssa! I haven't read Richelle Mead books yet, but I do have her Vampire Academy series on my Kindle but I have not read it yet. But now after reading your review for this book I am really want and I am very intrigued as well too read her books soonish. 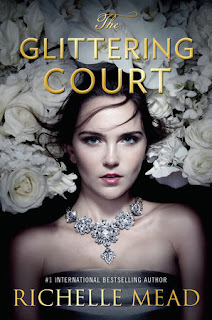 Especially The Glittering Court book. Thank you for the great post my friend. Oh I loved this book! I was so happy to see you enjoyed it too! I loved the idea of mixing two worlds/times to make this one it was so different but also semi familiar. And all the characters were fun to read and the burn between them....yep! I can't wait to see which girls perspective is next. Aw, yay :D I'm so so happy that you liked this book so much Alyssa. <3 I'm now more curious about it, lol. It do look so pretty :) And you do make it sound pretty much amazing. Sigh. Thank you for sharing sweet girl. <3 YAY for good romance :D That's the best, hih. It was lovely, inside and out! And the romance was SO good, easily the best part of the book. Gah! OOh nice! I actually find myself hesitant with this one because there's no paranormal, no fantasy elements (other than a made up world/society), and no magic. But since it's Mead I am willing to give book 1 a go! Glad to hear it reads like a standalone with spinoffs coming told in different character povs! Can't wait to read it! Very nice review! I just got the audiobook last week and I was super worried cause I love Mead but HATED Soundless. So happy this seems to be much better than SOundless! I just finished reading this book and really liked it. It's not as amazing as some of Richelle Mead's other novels (Succubus Blues and Age of X are by far my favorites), but a good quick read. I get the feeling people either love it or hate it, though. I was reading reviews on GoodReads and saw some people claiming it was racist and had a boring romance. March 2016 New Release Giveaway!